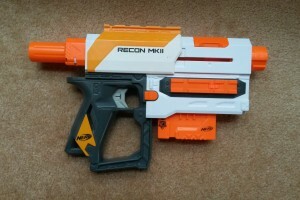 True to its namesake, the Recon MkII is far inferior to the Retaliator. 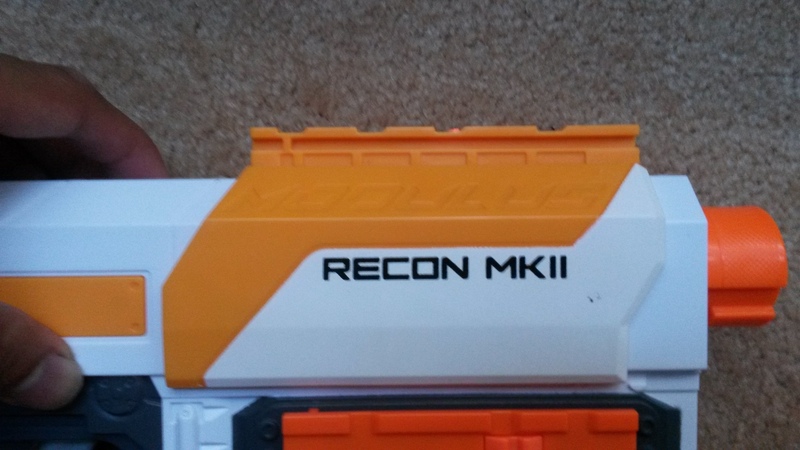 Everything in the Recon MkII package. 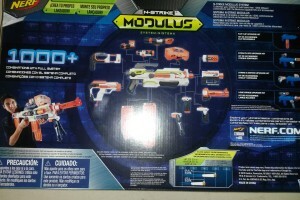 With the first Modulus blaster being a flywheeler, the next logical Modulus blaster to release is a springer, most likely based on the Retaliator for maximum tacticool. 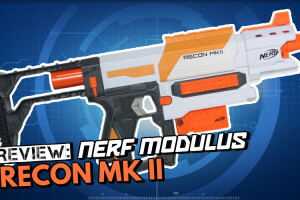 That’s exactly what Nerf has done with the Recon MkII, interestingly taking the name of the blaster that the Retaliator originally improved upon. 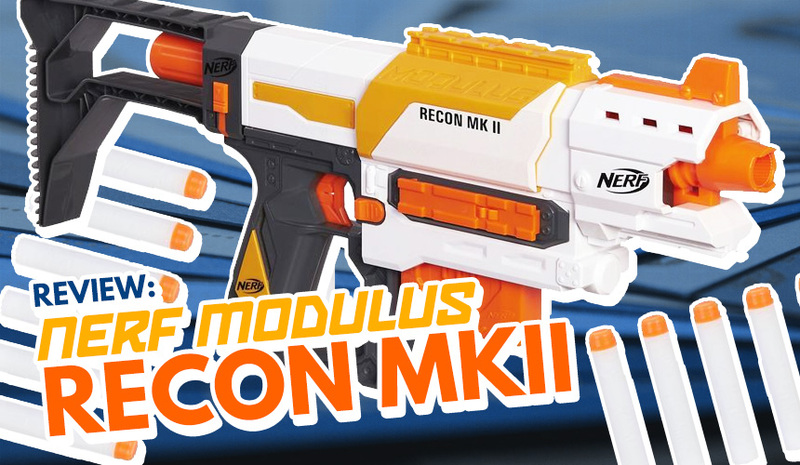 Does the Recon MkII improve upon the Retaliator then? 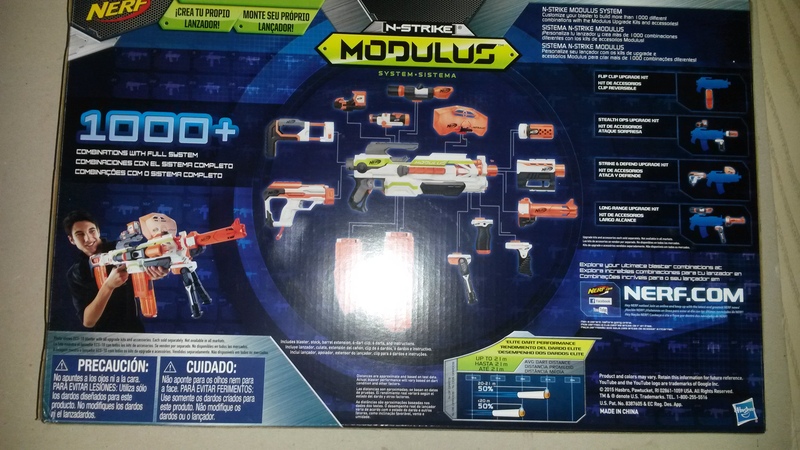 Pretty standard Modulus box fare – front is open and back is an advert for the line as a whole. 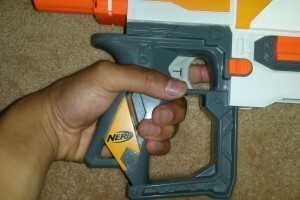 Sling loop on the handle. 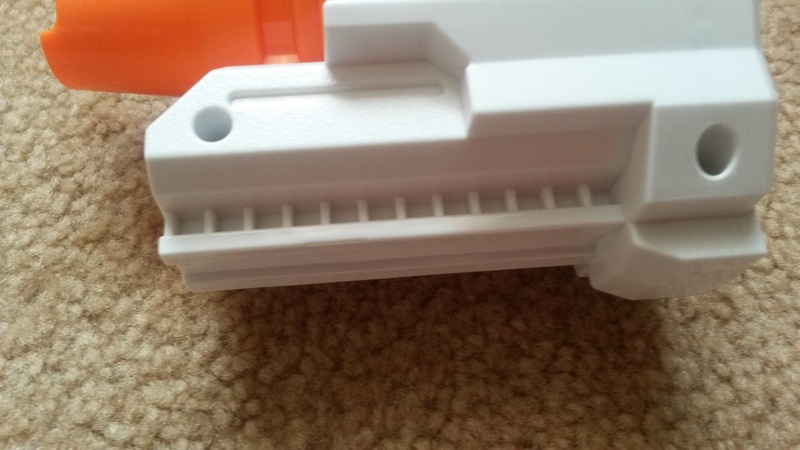 Tac rail on the slide. 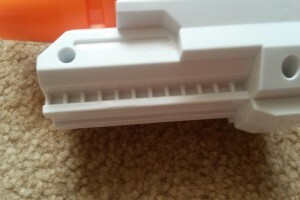 Tac rail on the side. Recon light on side tac rail. 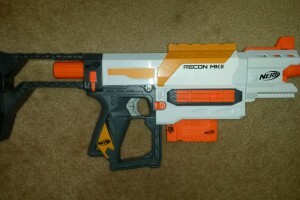 The Recon MkII is a well designed blaster, it has clear roots in the Recon/Retaliator platform, but has its own unique aesthetic with influence from the Modulus line. 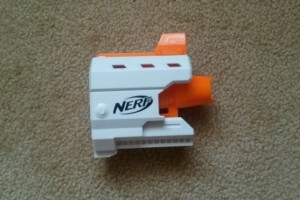 I quite like it, although I really dislike the lack of detail on the left side. 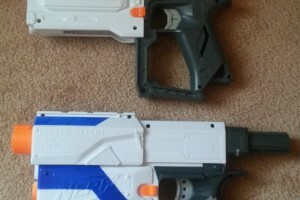 This blatant cost cutting really hurts the aesthetics, with much of the left side looking rather bland. 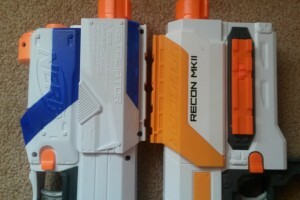 The front of the blaster is also pretty bland as it’s completely flat, in contrast with the Recon and Retaliator. 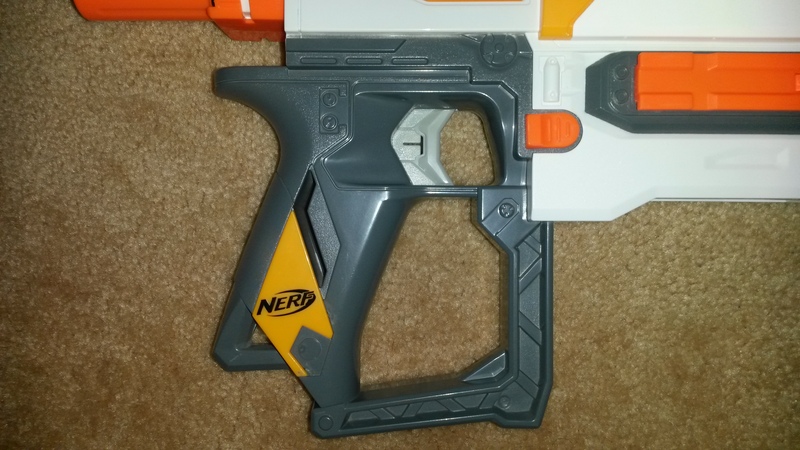 As is standard for a lot of N-Strike clip (mag) system blasters, the Recon MkII has a single sling loop at the bottom of the handle. 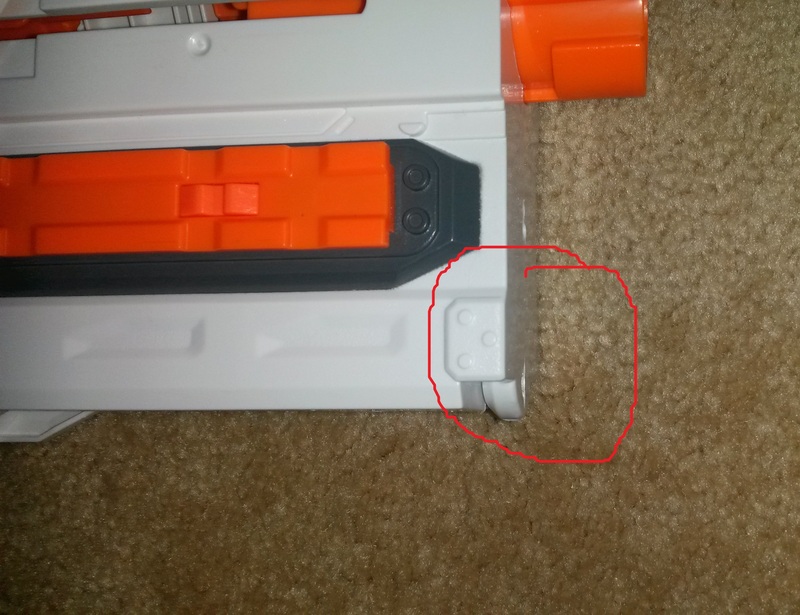 It has 2 tac rails, the standard one on top of the slide and one lower down on the side. 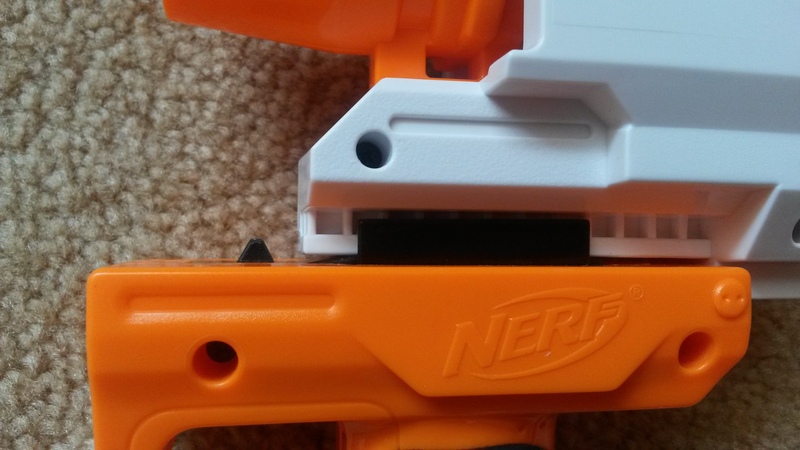 This new side rail is ideal for lights, though Nerf hasn’t released one for a while. 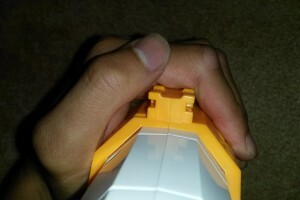 Close up of hand over raised tac rail. 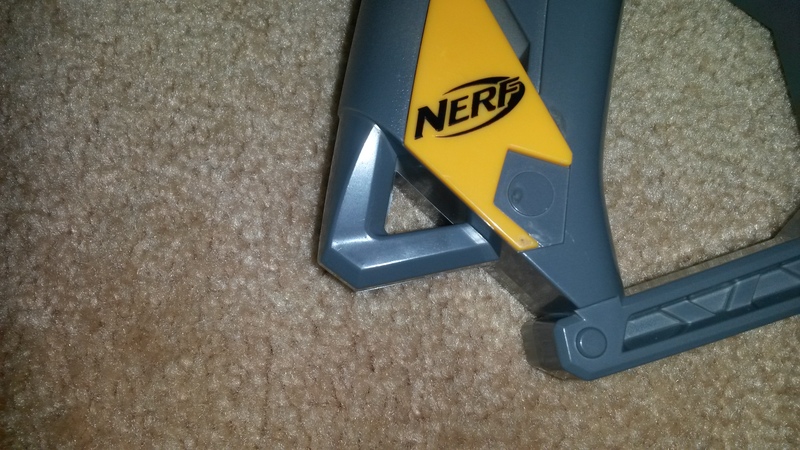 The handle is well designed, it’s smooth and nicely curved. I find it quite comfortable to grip, and the slot through the middle isn’t noticeable. 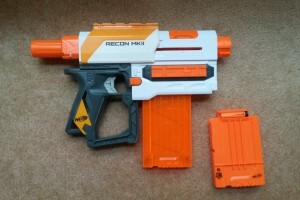 The priming slide is very similar to that of the Recon/Retaliator, though has one key difference. 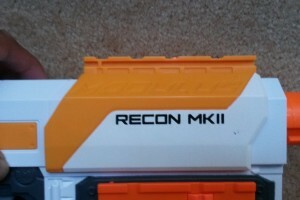 The tac rail on the Recon MkII is raised slightly, which is very noticeable in priming. 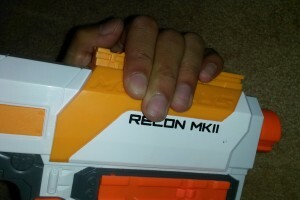 By virtue of being raised, the tac rail cuts slightly into your priming hand, much more so than the Recon/Retal. This is an unfortunate problem as it was rather unnecessary to raise the rail. Missing part in revised model. 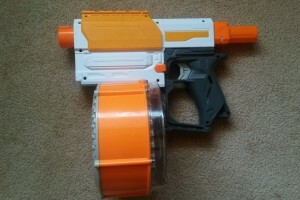 Changes in the revised model. 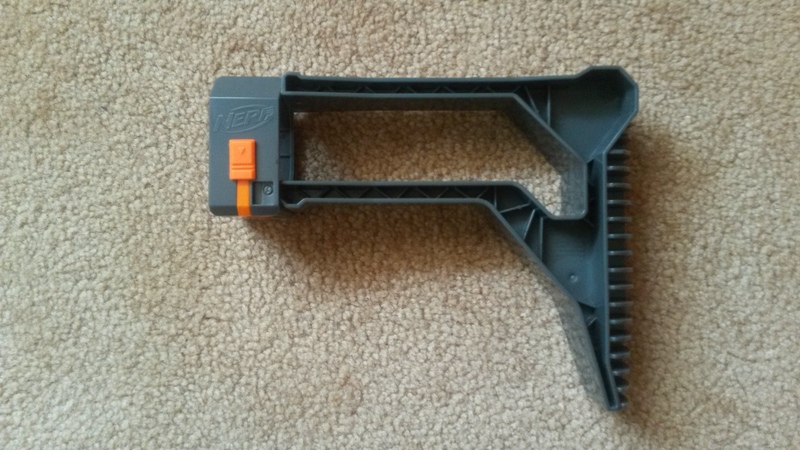 18 clip (mag) loaded, no problem. 25 drum loaded, no issues. 35 drum loaded, all good. 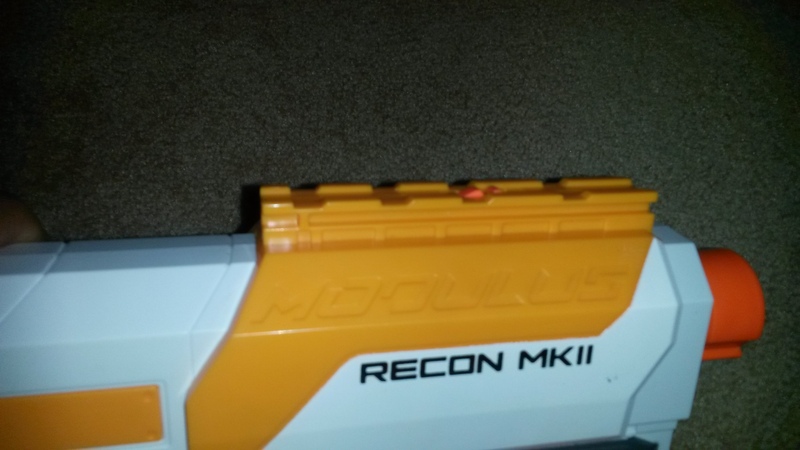 It’s important to note that my Recon MkII is a revised model. 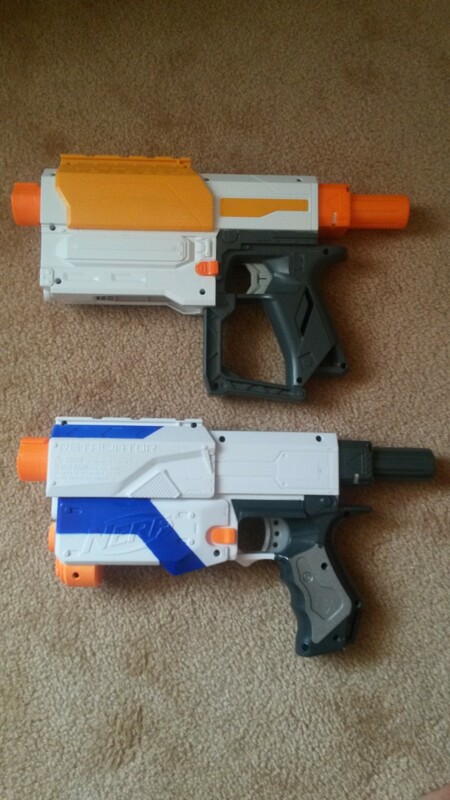 There are a couple of changes to the original mold. 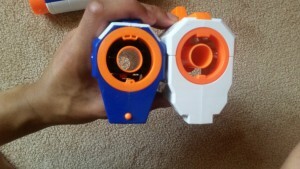 The first is that the revised model does not have a small nub on the front as the original does. This part is purely aesthetic. 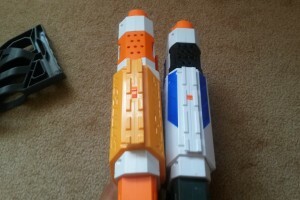 However there have been two changes in the magwell area. 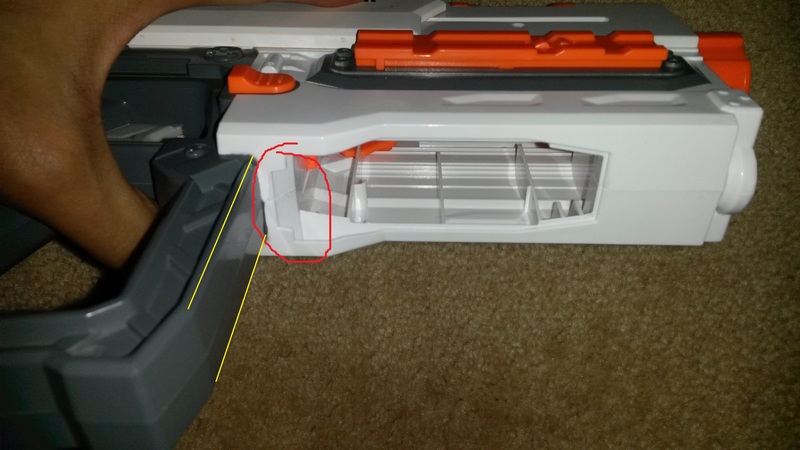 The revised model has a slot cut into the back of the magwell (circled in red), and the handguard has been thinned slightly (the yellow lines ended closer to the magwell in the original). 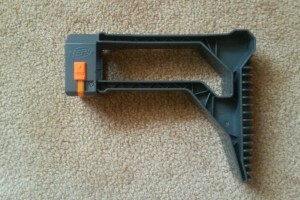 With the original mold, the only clips (mags) compatible out of box were the 6 and 12 dart clips (mags). 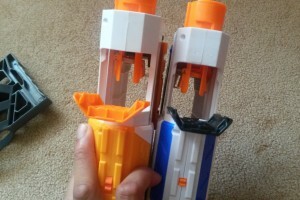 Larger ones like the 18 clip (mag) did not fit fully and could not be used. 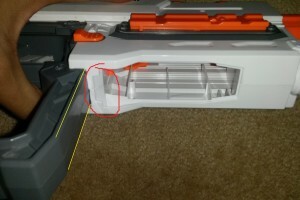 This oversight is quite baffling considering how important the cross compatible clip (mag) system is to Nerf’s success. 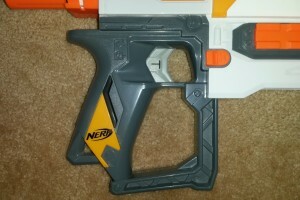 The revised mold’s main changes allow the use of all clips (mags) without issue. 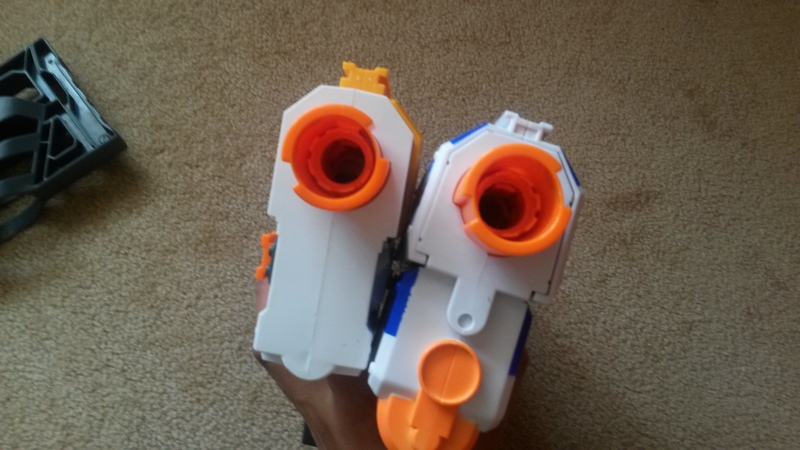 The magwell cut and handguard change are the functional changes, while the removal of the front nub is purely aesthetic, and is the easiest way to spot a revised vs original when still in box. 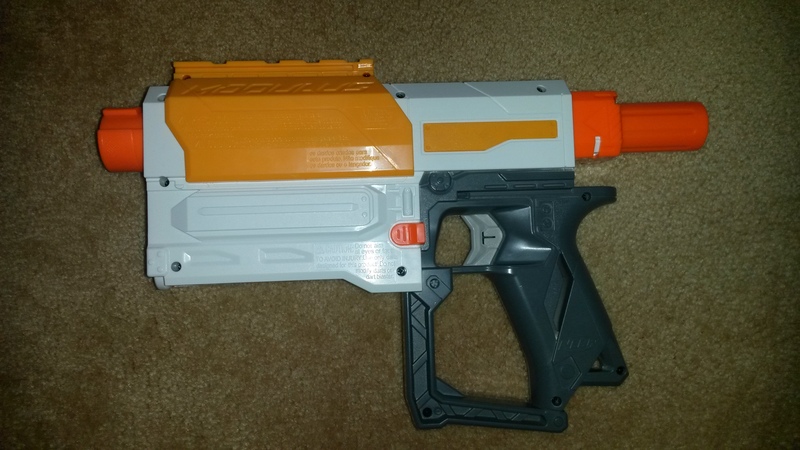 Slide pulled back, blaster primed, bolt opened. 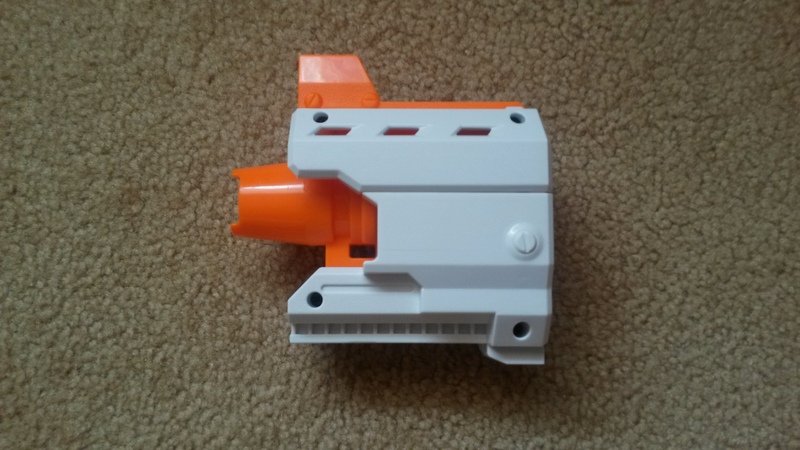 Slide closed forward, bolt closed, dart loaded. 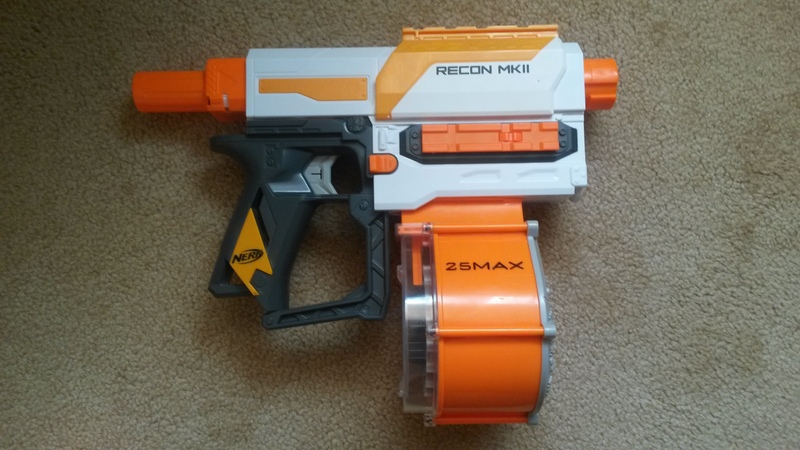 Being a standard manual springer clip (mag) system blaster, the Recon MkII operates the same as so many other blasters available now. 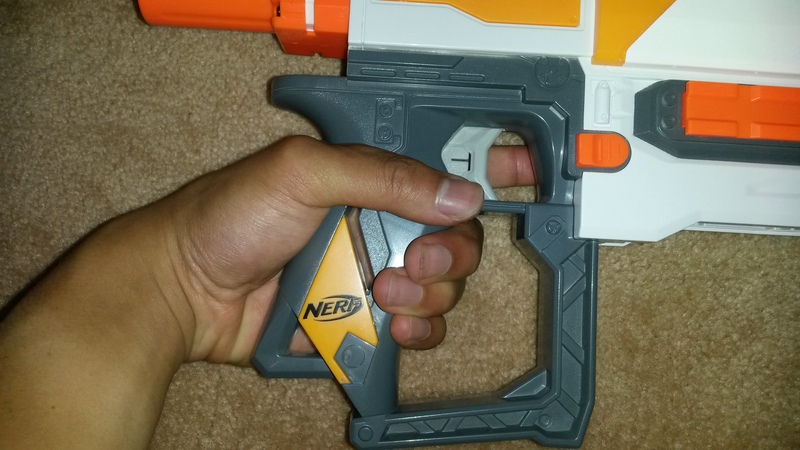 Pulling the slide back opens the bolt, allowing removal/insertion of a clip/mag. 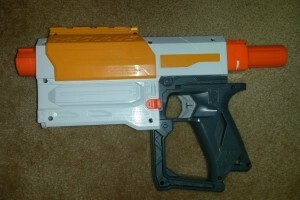 Pushing the slide forward again closes the bolt and chambers a dart, at which point the blaster can be fired. Rinse and repeat as necessary. 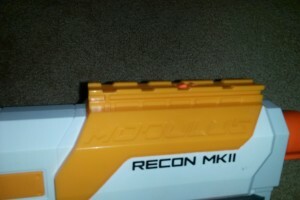 Recon MkII and Retal, right side. 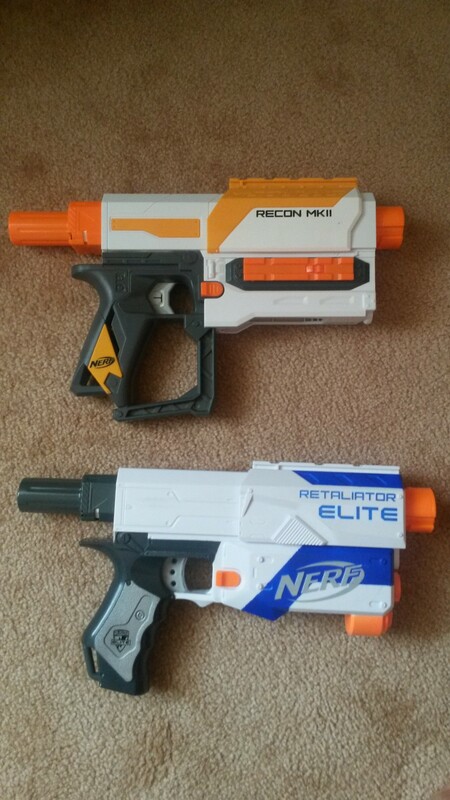 Here’s the Recon MkII next to a white Retal. 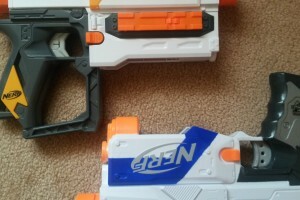 In terms of functionality and general shape, the two are extremely similar. 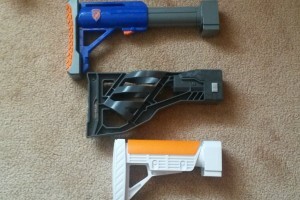 There are a number of obvious physical aesthetic differences, but the functional parts are mostly the same. 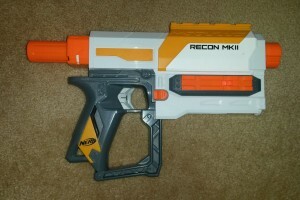 One notable difference is the fronts – the Recon MkII’s is completely flat and lacks the same barrel extension locking divot below the muzzle that the Retal has. 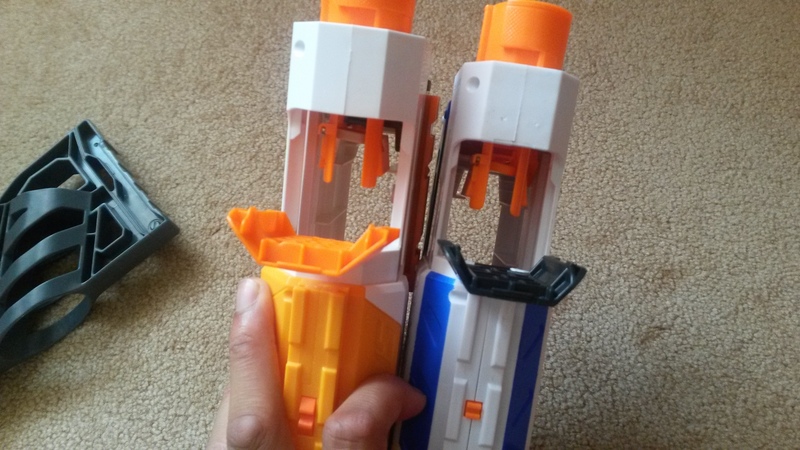 This is a big concern for barrel extension compatability, as without that divot a lot of barrels are much looser. 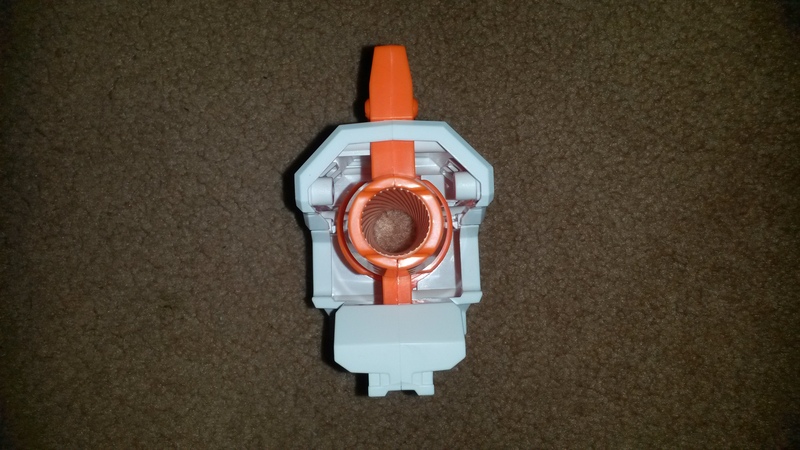 Right side of the barrel extension. 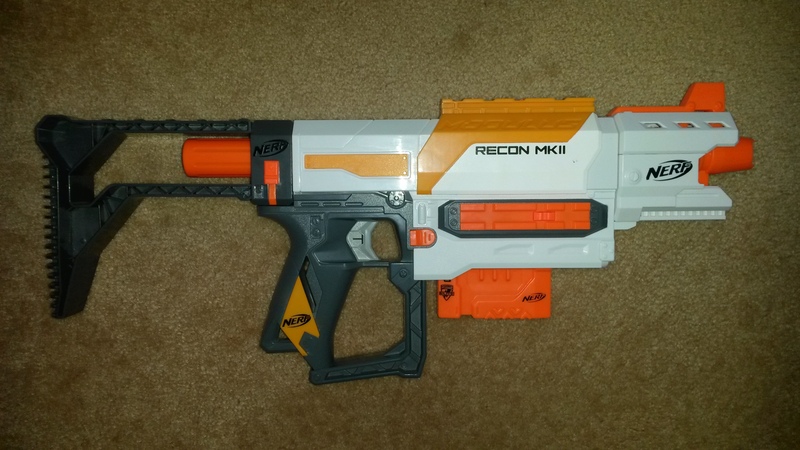 The Recon MkII’s barrel extension is an interesting piece. 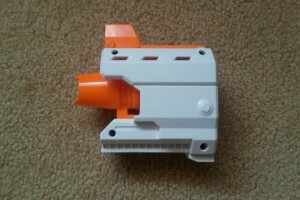 It is very aggressively cut and has an unusual muzzle, making for an unusual looking piece that I quite like. 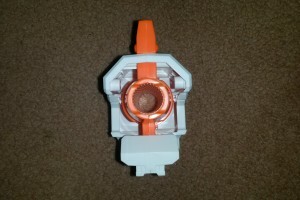 Looking from the front, it’s actually rather hollow, akin to the front of a Rapidstrike. 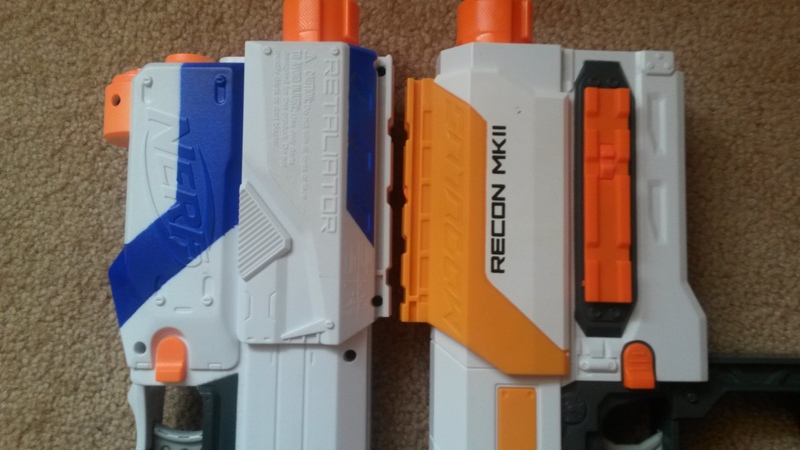 Rear comparison of the Recon MkII’s barrel vs a Retal barrel. 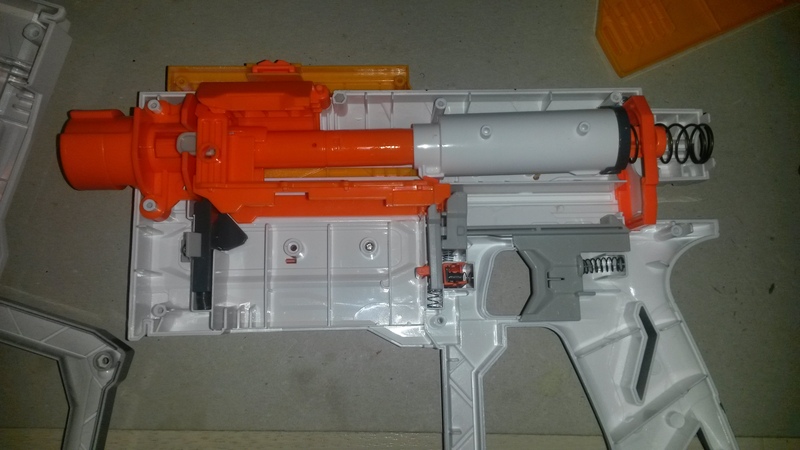 One key difference between this barrel and most barrels of this style are the locking mechanism. 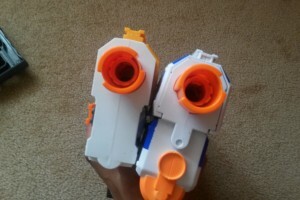 Most of these sorts of barrels use a spring loaded dome below the barrel, like the Retal barrel on the left. 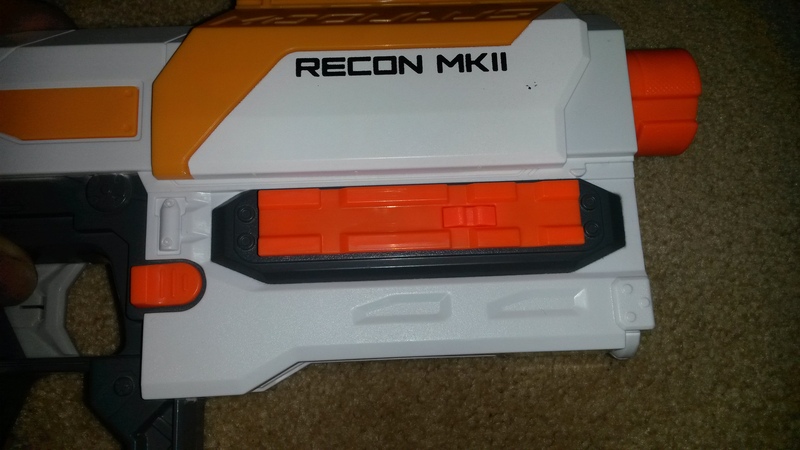 In contrast, the Recon MkII barrel uses the same mechanism as the Modulus Proximity barrel, which is a little looser but is self contained withing the orange ring. 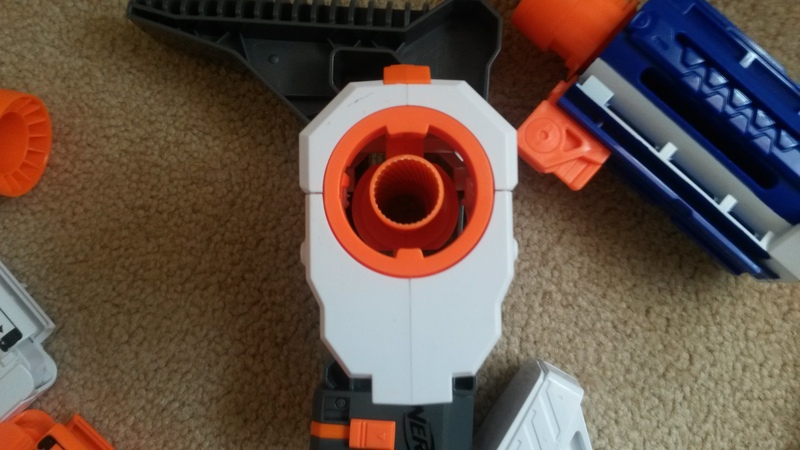 The Recon MkII of course lacks the divot necessary for the spring loaded dome to seat in, which is both a compatability issue and a worrying sign for the future – I much prefer the spring loaded dome as a locking mechanism. 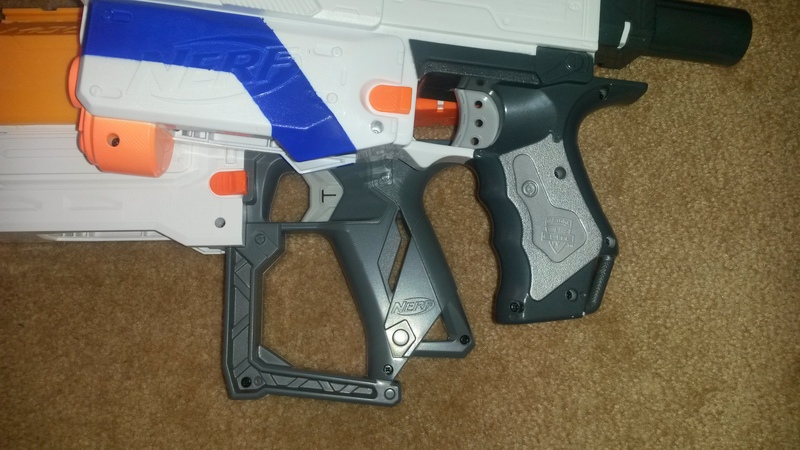 Shot of the fake rail on the bottom. 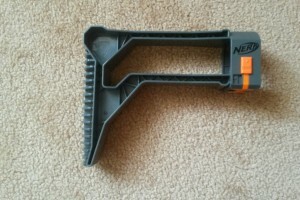 Foregrip semi-attached to the fake rail. 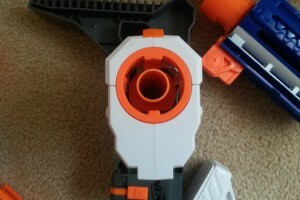 The barrel extension has a short faux rail on the bottom. 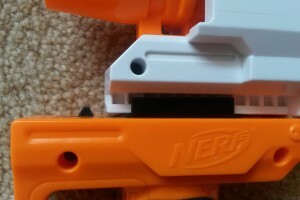 Though I would have liked a functional rail, that wouldn’t be possible with Nerf’s current tac rail locking mechanism considering its length. 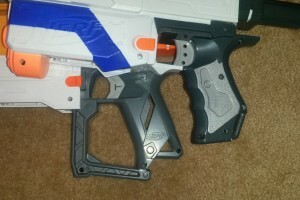 Some attachments will sort of clip on, but they’re not secure there and will fall off easily. 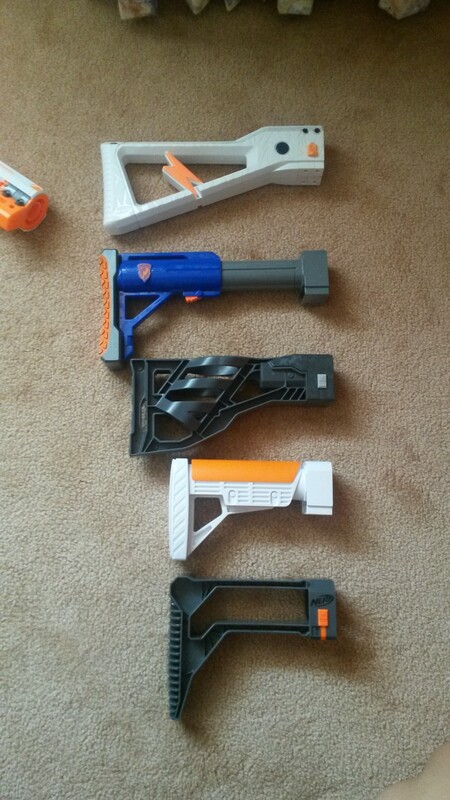 Comparison of various barrel extensions. 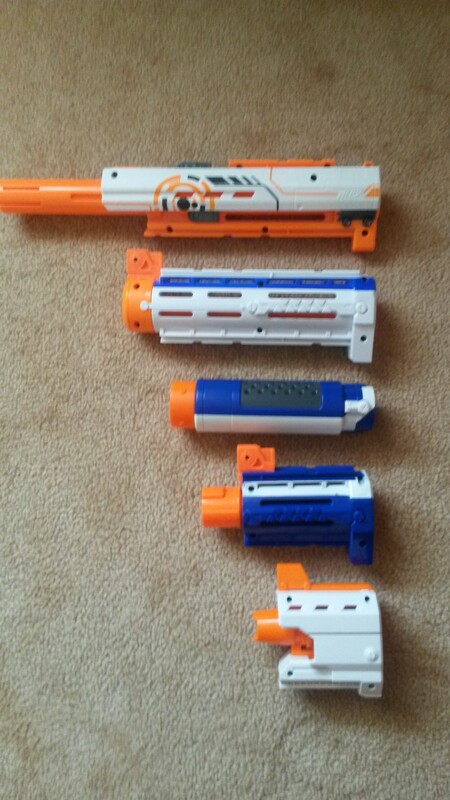 Here’s a variety of barrel extensions lined up, the Recon MkII’s barrel is extremely short even compared to a half Recon/Retal barrel. 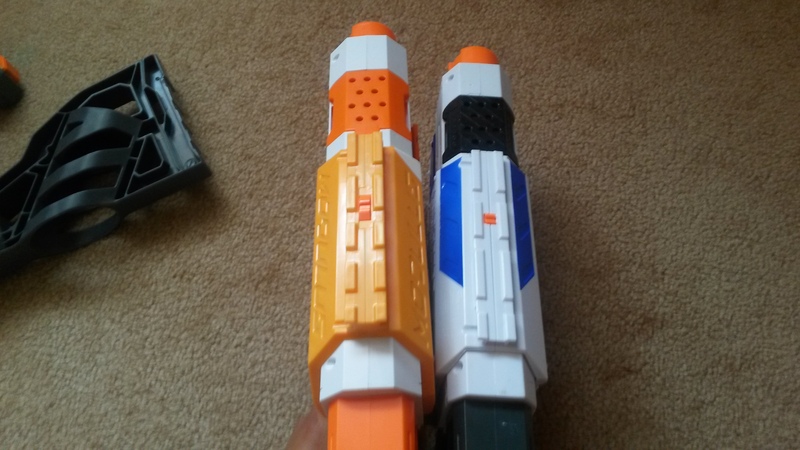 The only barrel extension that could be of comparable length I can think of is the Proximity Barrel, but unfortunately I don’t have one on hand. 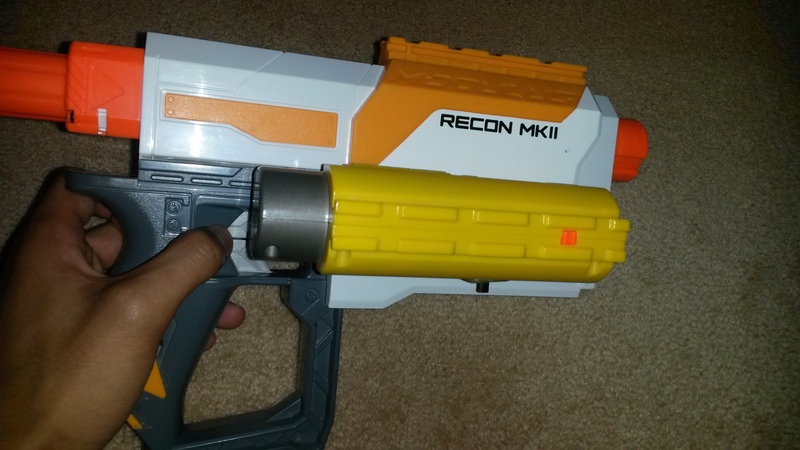 The Recon MkII’s barrel doesn’t serve any real purpose, so is something you’d want purely for aesthetics. 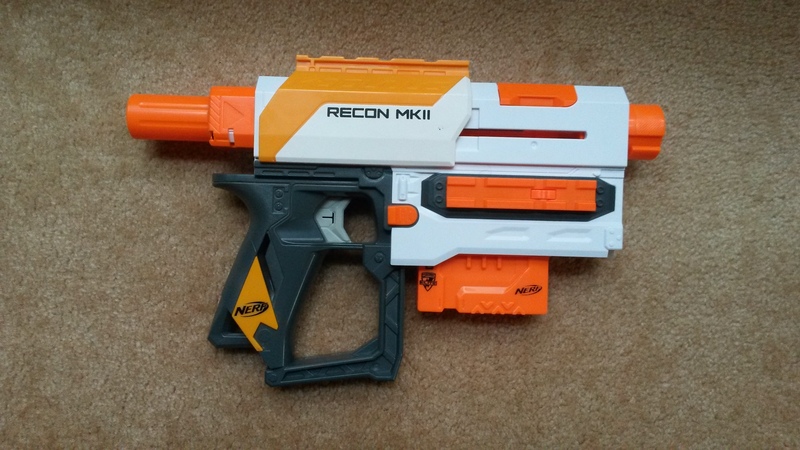 In contrast, the Recon MkII’s stock is pretty boring, being flat grey and having no special features. It’s also painfully short, comparable to the Stormtrooper Deluxe Blaster’s stock. 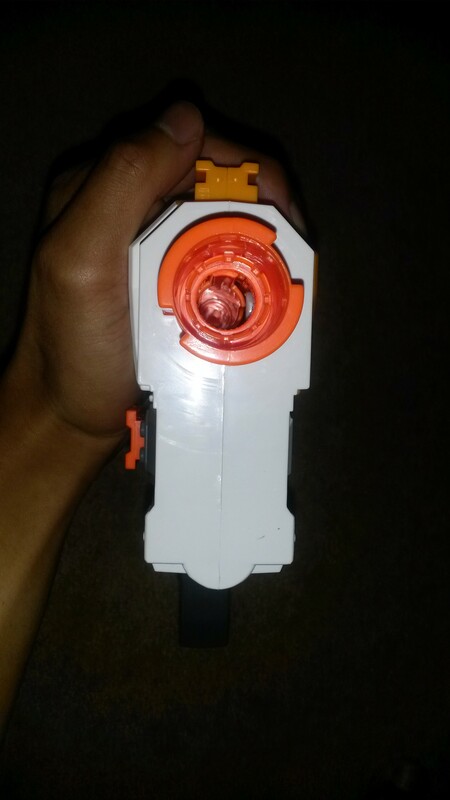 Its length makes it practically unusable and the lack of special features just makes it worse. 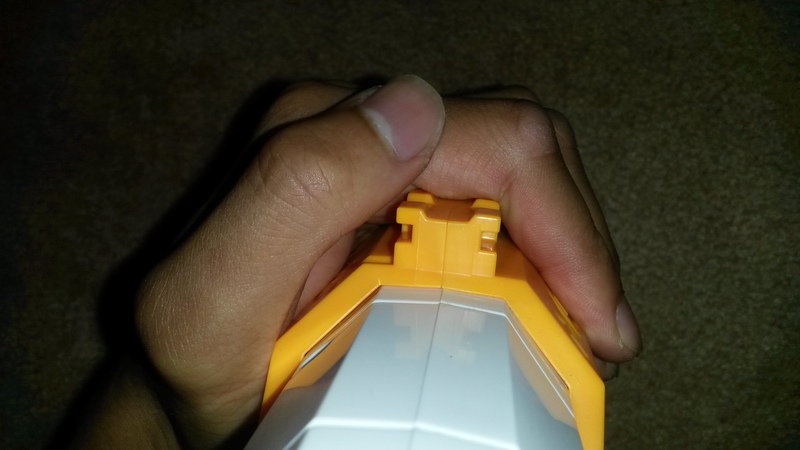 At very least, it’s a solid stock. 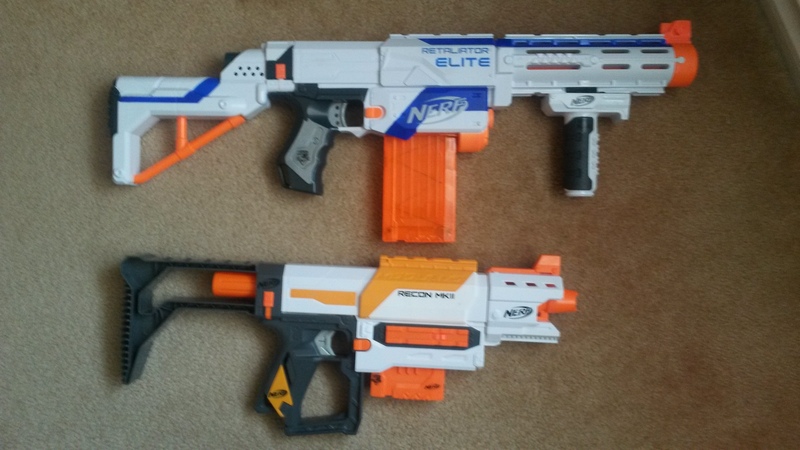 This stock overall is probably one of the worst that Nerf have produced. 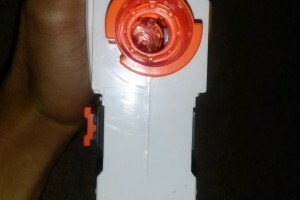 Right side of the full blaster. 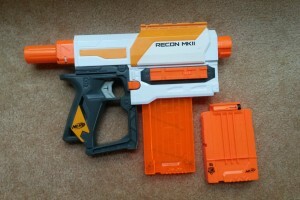 The full Recon MkII kit looks fairly good, though none of its parts are actually that useful. 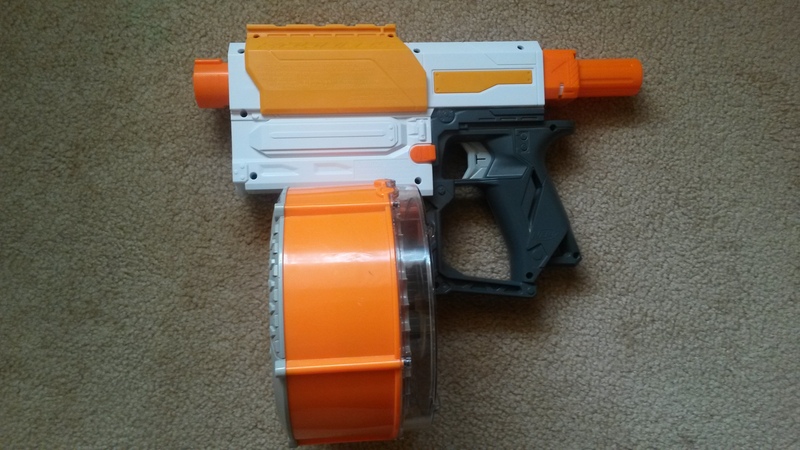 The full Retal kit is a good bit bigger, though in contrast, its barrel is ideal for pump grips, and the foregrip is useful for a cheap DIY pump grip. 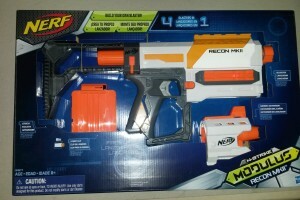 Finally for performance. 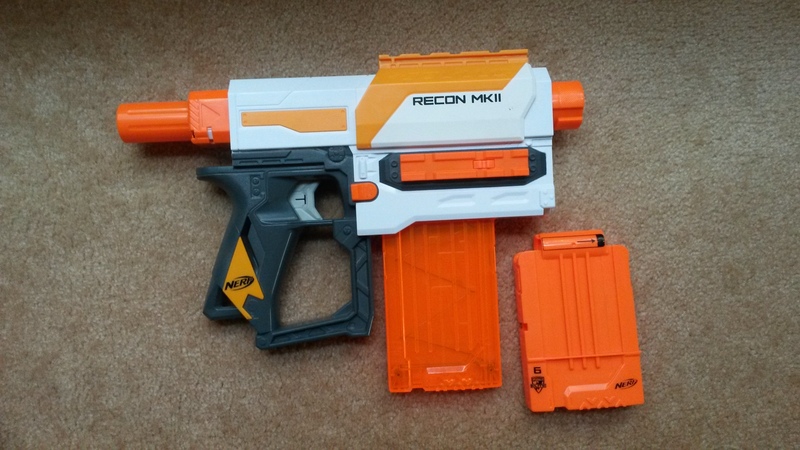 Does the Recon MkII live up to its tried and testing sibling, the Retaliator? Sadly, no. 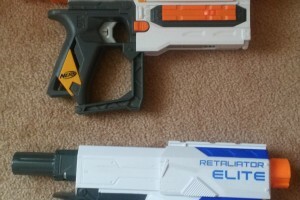 Range is fairly poor for an Elite-era blaster, at around 9-10 metres with Elite style darts. 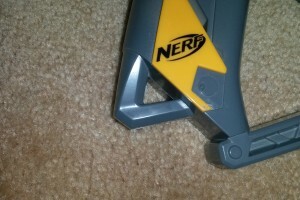 A fair number of darts like to dive into the ground at shorter ranges. Accuracy is also unremarkable. I was getting a fair amount of spread at ~9 metres. 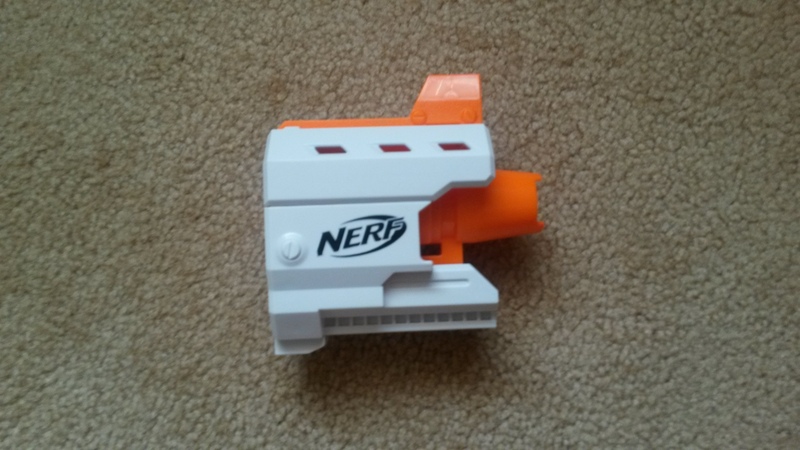 Not as bad as other blasters I’ve seen, but far from the best. 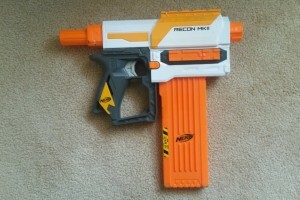 Rate of fire is pretty much identical to the Retaliator, 2-3 darts per second with good technique and locks removed. 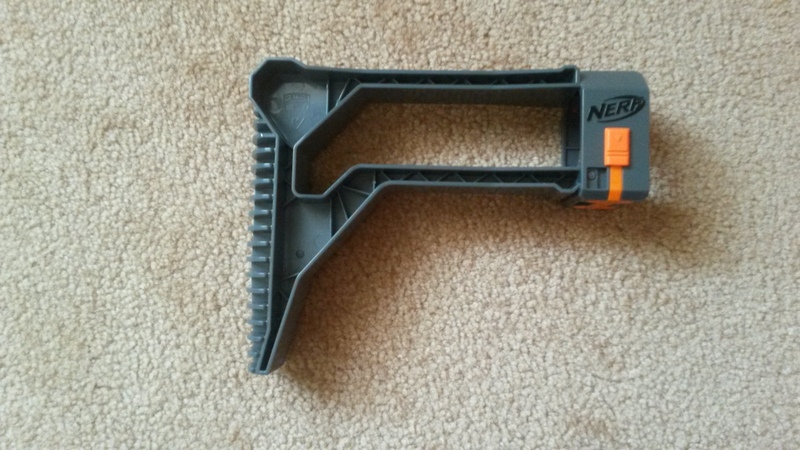 Certainly enough to be usable unless you’re taking on a lot of enemies. 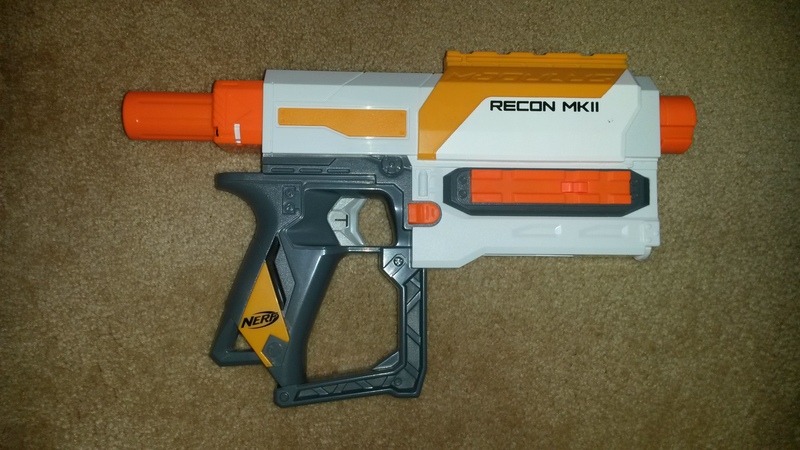 The Recon MkII plays a similar role to the Retaliator, except it’s nowhere near as good. 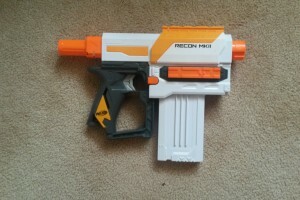 Unlike the Retaliator, it has neither notably good range nor surprisingly good accuracy with the barrel extension. 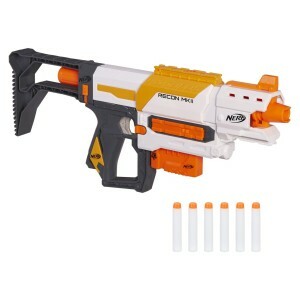 It’s stock is too short to be used by most teens and adults, and the barrel extension has no practical role. 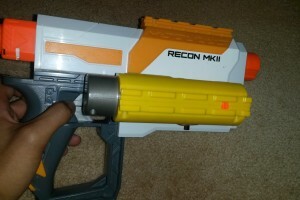 The Recon MkII’s best role is as a close quarters large pistol, as like the Retaliator, the base blaster is very small. 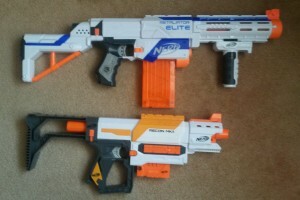 However it faces big opposition from the Retaliator itself, which can be stripped down to be slightly smaller, and is a far better performer. 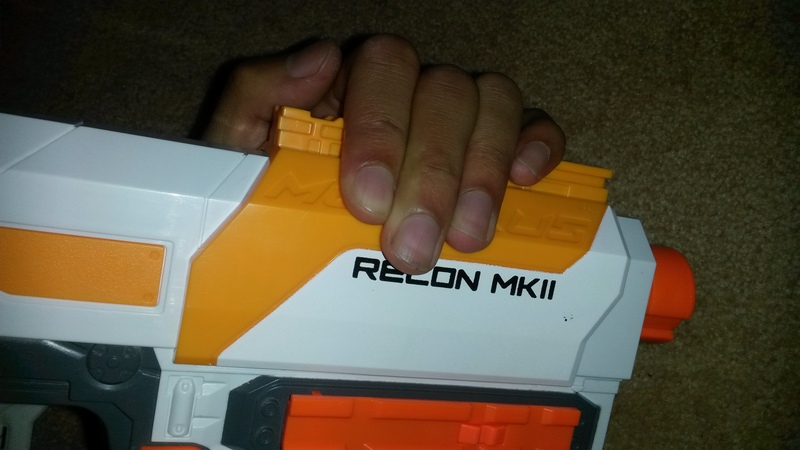 There is no legitimate performance reason to use a Recon MkII over a Retaliator. 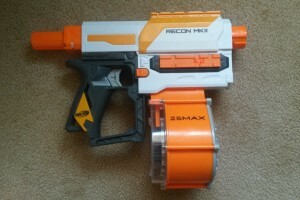 The Recon MkII retails for around 40AUD, with sales taking them down to ~30AUD usually. 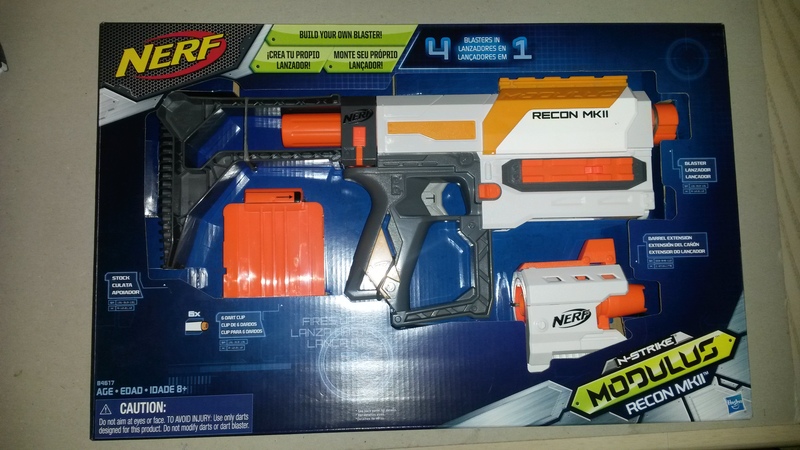 I picked one up for 20AUD as Myer made a mistake in their catalogue and switched around the Ion Fire and Recon MkII prices. 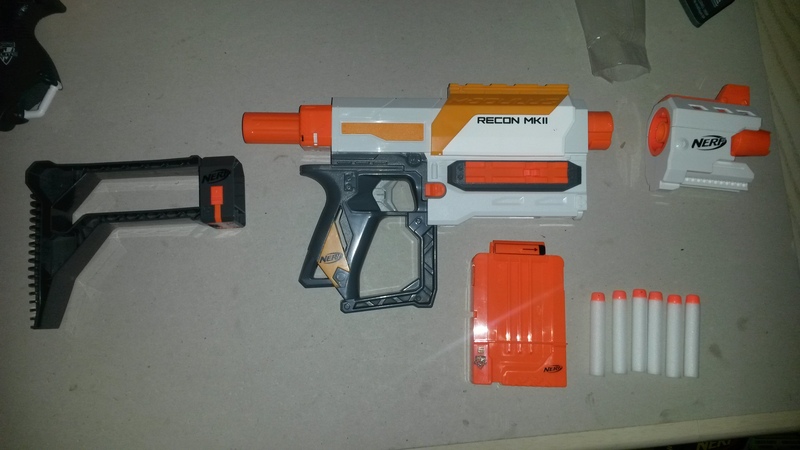 Even for that price, it wasn’t a particularly good buy, and at ~30AUD, I wouldn’t even consider it. 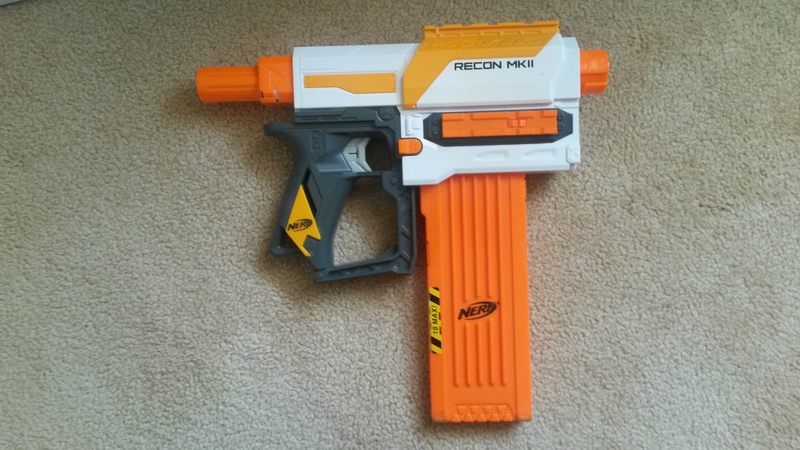 One of the main problems is the existence of the Retaliator, which is cheaper (29AUD from Kmart), a better performer, internally superior, has better barrel extension compatability and comes with better accessories (primarily the 12 clip [mag] and barrel for pump grips). 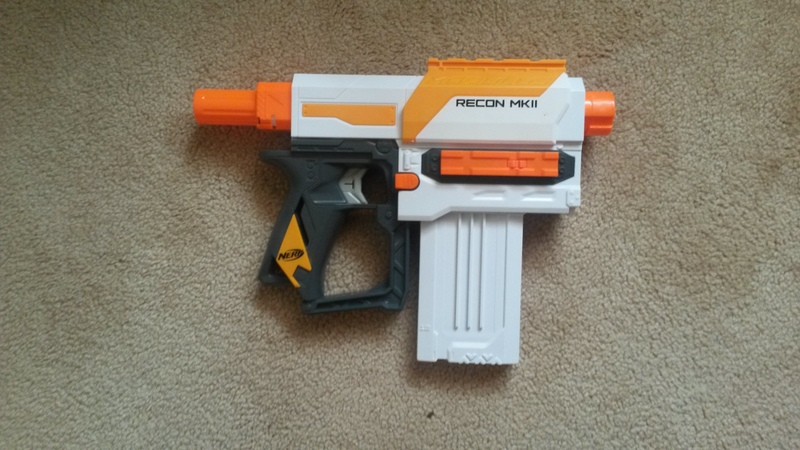 The Recon MkII is not a particularly good buy or a good performer. 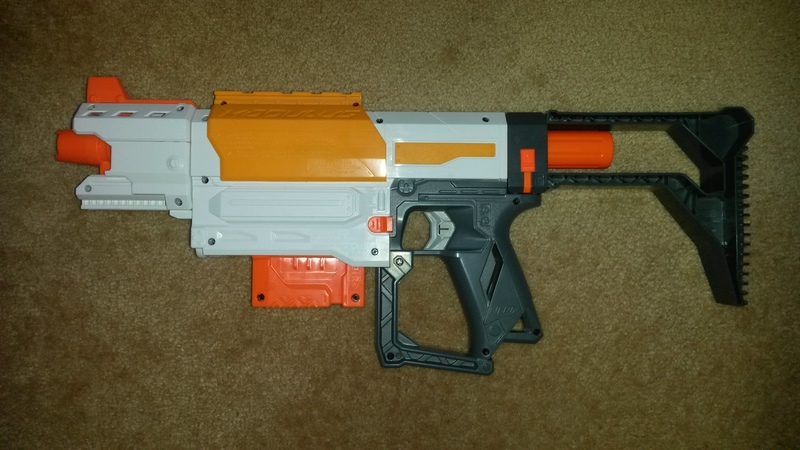 Unless you’re in love with its aesthetics and barrel extension and can get it for a good price, I’d give it a pass. 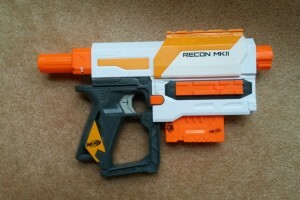 In a way, it’s faithful to it’s namesake the Recon – the Retaliator is far superior. 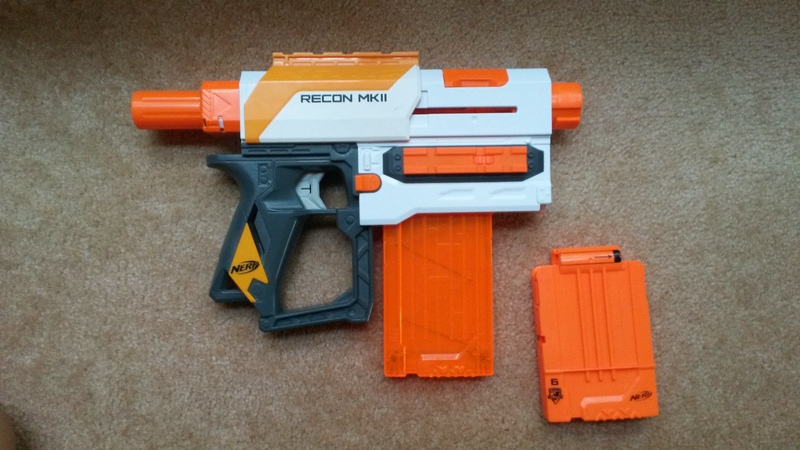 Recon MkII internals, pretty similar to the Retaliator. 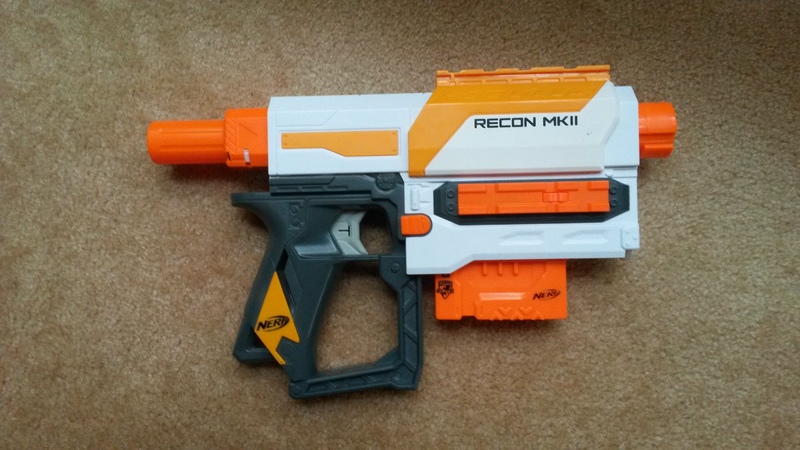 For mods, the Recon MkII is much the same as the Retaliator with a few caveats. 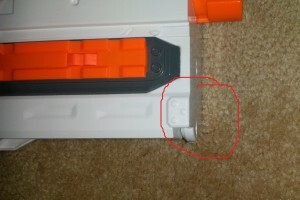 First is that the bolt has 2 air release holes instead of the usual 1, and the boltsled pin is plastic rather than metal. 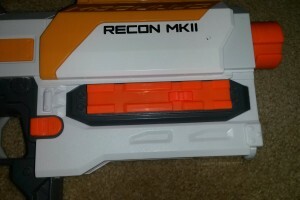 Besides that, the internals are pretty much the same, so you should be able to get the Recon MkII up to respectable performance. 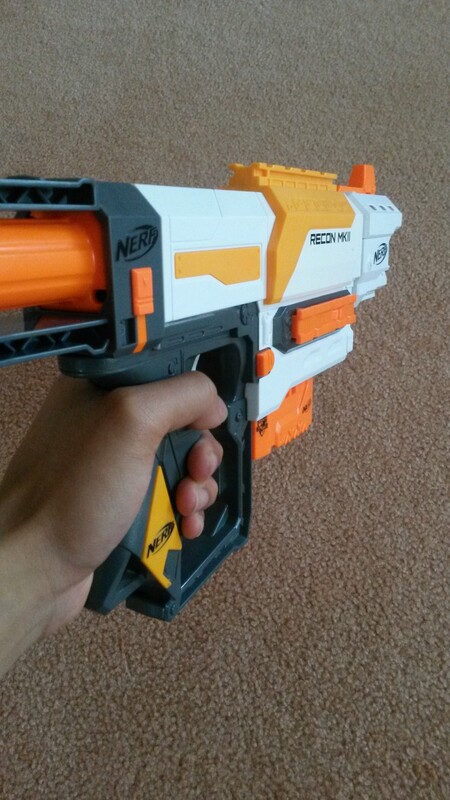 100fps muzzle velocity is certainly possible with a good spring, internal setup and good darts. 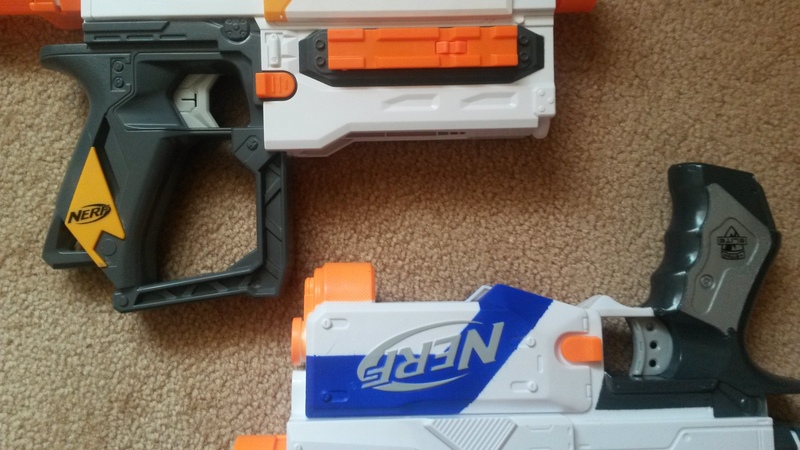 This entry was posted in Dart Blasters, Reviews and tagged australia, grey, mkii, modulus, n-strike, nerf, recon, review, trigger on May 4, 2016 by Outback Nerf. 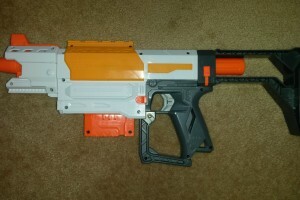 WHAT AMMO USE THIS GUN?